The playground is not the happy place you think it is. Slides are owned, swings are fought over, and don’t even think about jumping on the monkey bars without permission. Adults only see kids playing and running. What they fail to understand is that behind every child’s smile, laugh, and skip lurks an agenda. The playground is a war zone and the kids who play in it are the soldiers. Time for you to get into the fight! 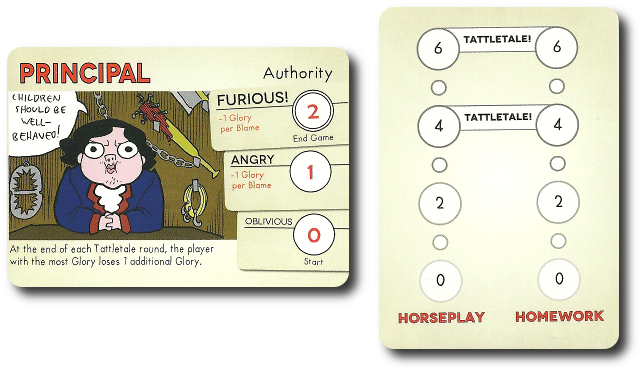 Tattletale!, designed by Will Emigh and published by Game Salute, is comprised of 4 Plot cards, 3 Opposition cards, 10 Student cards, 5 Glory cards, 1 Horseplay/Homework Tracking card, 1 Teacher/Principal card, 3 Tracking tokens, 5 Scoring tokens, and 1 Lead token. The cards are made of solid card stock and are as durable as your standard playing card. The tokens are made of thick cardboard. Quick note about the Student cards. My game contained 10, but I believe the game to be provided will only include 5. If it does, you won’t be losing out on anything. I essentially have 2 of every Student card type. When playing, you can only play with 1 of each type, not 2. For example, you cannot play with 2 “Teacher Pets”. Perhaps a moot point, but worth mentioning if anyone wonders why I am listing a higher component count than what you might have in your game. To set up the game, first separate the cards by type. You should have different piles for the Plot, Opposition, Student, Glory, Horseplay/Homework, and Teacher/Principal cards. Second, shuffle the Student cards and hand one to each player, face-down. Players should keep their Student card hidden from their opponents until revealed at the end of the game. Any Student cards not used should be returned to the game box without revealing what the cards. Third, hand each player 1 Glory Tracker card and 1 Scoring token. Unlike the Student card, the player’s Glory Tracker card is visible to everyone. Each player should place their Scoring token on the “0” space. Fourth, create 2 sets of Plot cards and set them down in the middle of the playing area. 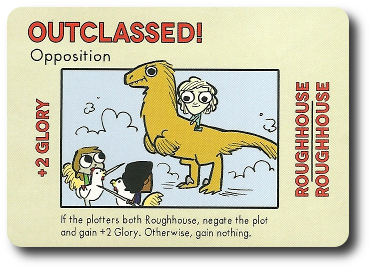 Each set should have 1 “Roughhouse” and 1 “Study” Plot card. Take the 3 Opposition cards and place them, face-down, next to the Plot card piles. Fifth, decide to use the Teacher or the Principal (the Principal makes the game more difficult to win and a bit longer) and set the selected side face-up in the middle of the playing area. Place the Horseplay/Homework Tracker card next to the Teacher/Principal card. Place 2 Tracking tokens in the “0” spaces. Place the last Tracking token on the “0” space on the Teacher/Principal card. Tattletale! is played in rounds (referred to as “Plots”) with no set number of rounds per game. All players will participate in each round, but not have as many actions. A typical round is summarized here. The current Lead player (the one with the Lead token) takes the 2 sets of Plot cards and gives 1 set to a conspirator of their choice. This can be any other player. Even a player that had already been selected as a conspirator or was the Lead player during the last round. The goal for the Lead player here is to select a player who they think they will be able to trust or manipulate. The first non-plotter player (i.e. the first player without Plot cards) to the left of the Lead player takes the Opposition cards. The opposition player now attempts to determine which Plot cards the conspirators will play. There is very little information available to them, but the choices are finite. 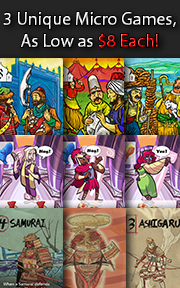 Each Opposition card is a combination of the Plot cards. Specifically, Study/Study, Roughhouse/Roughhouse, and Study/Roughhouse. The opposition player should select the Plot card combination they think the plotters will select and place it face-down in front of them. The two plotting players (i.e. the two players with Plot cards) now decide on a plot. There are two plots. These are studying and roughhousing. What the two plotters are attempting to do is agree on what Plot card they should both play in an attempt to get points. But there’s a catch. Players can sabotage each other. 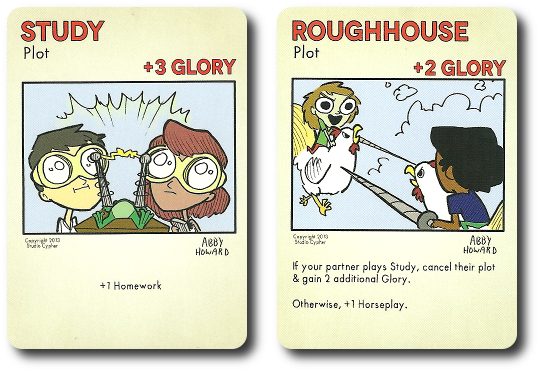 For example, if 1 player plays the “Study” Plot card and the other plays the “Roughhouse” Plot card, the Plot has been foiled. Additionally, if the opposition player selected an Opposition card that cancels the plotters cards, they will miss out on points. Talk about pressure! Making this exercise even more interesting (or difficult, depending on your point-of-view), is that all the players, including the opposition, can contribute to the conversation. The opposition knows what they selected and can attempt to subtly persuade the plotters to select certain Plots. At the same time, the other players who are not playing as the plotters or the opposition should do all that they can to guide the game in a way that satisfies their hidden Student card agenda. After the plotters have agreed (or think they’ve agreed) on what Plot cards they want to play, each plays 1 Plot card, face-down, in front of them. The other Plot card is kept hidden and off the table. Only after the 2 Plot cards and 1 Opposition card have been selected are they revealed by flipping them face-up. Players now score points based on the revealed cards. There are 3 possible ways scoring can go. Glory points are scored on the player’s Glory cards using the Scoring token. Any Homework or Horseplay scores are recorded on the Homework/Horseplay Tracker card next to the Teacher/Principal card. If a player should even obtain 12 or more Glory or the Tracker token goes above “2”, “4” or “6” for Horseplay or Homework, an interesting thing happens. All the players do their very best to throw another player under the school bus, figuratively speaking. The first thing that happens is that the Tracker token on the Teacher/Principal card moves up the Authority track, signifying the growing anger of the adult educators. Then all the players decide who among them should “take one for the team”, so to speak. This can be one player, two, or even more. Players are welcome to debate as loudly and as passionately as they like, but they only have about 2 minutes to do so. After the last desperate plea has been spoken or angry word shouted, the players now vote. On the count of “3”, all the player casts 2 “Blame” votes. This is done by pointing a finger at any player, including the player who owns said finger. For every finger-pointing at a player, they receive 1 “Blame” vote. For every “Blame” vote a player gets, their Glory points are reduced by 1. The player with the most “Blame” votes loses an additional Glory, as well . For example, receiving 2 “Blame” votes reduces a player’s Glory by 2. 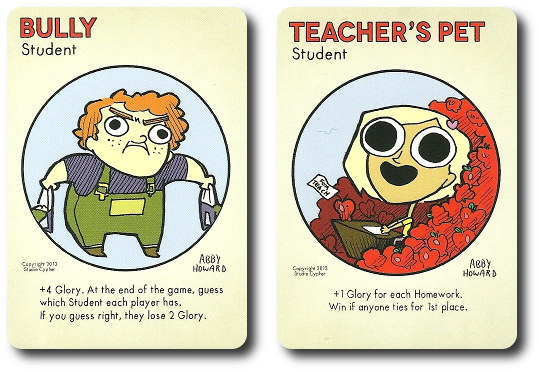 Note that the amount of Glory lost increases as the game progresses as the Teacher/Principal starts to lose their cool. This ends the round, regardless if the players accused each other or not. The Lead token is passed to the next player in turn order sequence and a new round begins. The endgame is triggered when the Teacher or Principal blows their lid and sends everyone to detention for the rest of their lives. In game terms, this means the Tracker token has moved to the “Furious” space on the Teacher/Principal card. Players now reveal their Student cards. Each Student card has a secret agenda that awards the player additional Glory. If the agenda condition has been met, the player adds Glory to their Glory card. The player with the most Glory wins the game. 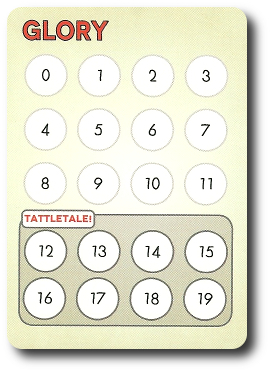 To learn more about Tattletale!, visit the game’s web page. Games like Tattletale! are very social. As such, they tend to sink or swim based on the level of communication and interaction the players put into it. Other games require the players to conform to specific rules and guidelines. Tattletale!, like Are You A Werewolf? and even The Resistance (two games I suggest you try), give the players guidelines and the majority of the game is defined while it’s being played. Yes, I know that’s a difficult concept to grasp, especially if you are a non-gamer. What I am suggesting is that Tattletale! has a metagame under the covers and that’s where the true game play resides. This makes it difficult to determine if a game will be enjoyed by an individual when the overall game play is dependent on a group to engage one another in the metagame. If they do, good times will be had by all. If not, the game will completely fail. 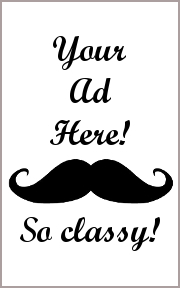 But, since I love a challenge, I predict that the Child and Parent Geeks will both like and dislike Tattletale! I can see a number of these group members “getting the game” and the other half having no idea what it’s about. As for the Gamer Geeks, I believe Tattletale! will not win them over. Even if the metagame is played, the game itself appears to be a bit redundant. Teaching Tattletale! is not easy and the game rules won’t be of much help, either. We had to read the game rules several times and play a game or two until the game and the metagame all came together. Which is not to suggest that the game rules are poorly written. There are some points I would have liked to have seen clarified, but the rules will get you there. What is not explained and cannot be explained fully is how the players should interact with each other and go about playing the metagame. This might have been done on purpose or not. As such, if you are teaching this game you need to focus on the following points after going over the very easy game rules. Each player has their own agenda based on their Student card. If the player is able to succeed with their agenda, they will get more points. Players cannot win the game alone, but they shouldn’t depend on others to help. Talking might seem important at first, but what is more important is trying to figure out what each player’s Student is so as to determine what their agenda on the playground might be. If a player can remember those 3 bullet points, they’ll be in good shape. If not, they are going to be lost. Note that this game does require the player to be able to read their Plot and Opposition cards. Younger players who cannot yet read should team up with an older player. And so, after teaching Tattletale! to my oldest little geek, I asked him his thoughts on the game so far. Ha! You know, as a parent, I teach my children not to lie, be honorable, and be sensitive to another person’s feelings. But some of that goes out the window when you sit down and play a game. Especially when those games require the player to be a bit dastardly. Tattletale! is such a game. Let’s get it to the table and see if this is a game worth tattling on. The Child Geeks were mixed when it came time to approve or reject this game. The older and more experienced Child Geek understood how the game was played, but struggled with the metagame. The plotters never really seemed to communicate well with each other, for example. According to one Child Geek, “I understand what the game wants me to do, but I’m having trouble making that happen.” Very insightful! Another Child Geek said, “I don’t like this game. I don’t know how others are scoring points and why I am not.” Yes, that can be very frustrating. In the end, the only Child Geeks who “got the game” were those who had played other social metagames in the past and understood that the real challenge was reading and interacting with the players, not the game. The end result was a mix of so-so approvals and disgusted rejections. The Parent Geeks did much better, but their higher level of skill didn’t improve the game play. The Parent Geeks didn’t communicate as well as they should have or didn’t get into the game. You have to really engage other players in Tattletale! If you just sit back and only do the minimum, Tattletale! is going to feel boring. According to one Parent Geek, “This is a game that will only do well if you have the right people at the table.” I totally agree. Another Parent Geek said, “What I don’t like about this game is that you have to depend on others to be just as excited as you. If they aren’t, the game stinks.” But it was not all doom and gloom. We had a few groups that really enjoyed Tattletale! One very happy Parent Geek said, “I really like this game. It’s fast, doesn’t take long, and you get to challenge your abilities to hear what isn’t being said. 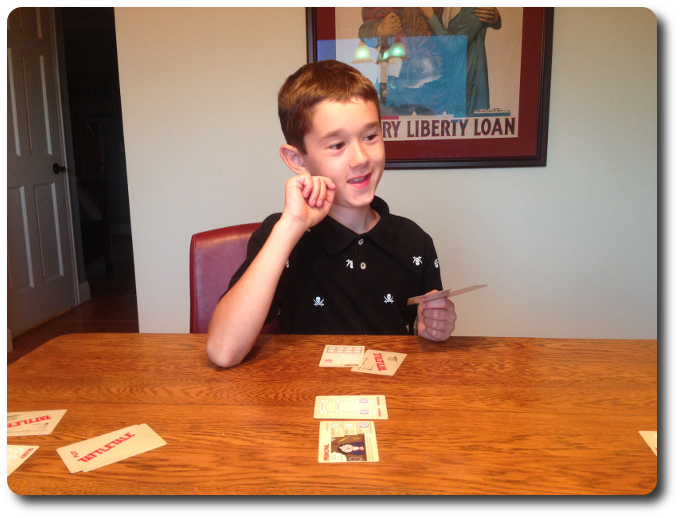 Great stuff.” When the game was finally put away, Parent Geeks gave Tattletale! an equal number of approvals and rejections. The Gamer Geeks did not like this game. They opened it up, read the instructions, played 2 rounds, asked me if “that was it”, and then rolled their eyes. According to one Gamer Geek, “The game play is redundant – that’s true – but so are a lot of other games. What I don’t like is that the other players just have to sit on their hands while the plotters and opposition have all the fun.” I reminded him that all the other players can talk, too. To which he responded, “So what? It doesn’t do anything other than add more noise at the table.” Another Gamer Geek said, “I see what this game is trying to do, and I think with the right people it would work, but I dislike games where I have to find specific players. It makes the game more labor intensive and less fun.” And finally, one Gamer Geek said, “I think this would be a good game for traveling with, during camp outs, and such. It’s not big enough to be a party game and it’s a bit shallow to be a game I would want to play with other Gamer Geeks at a convention. 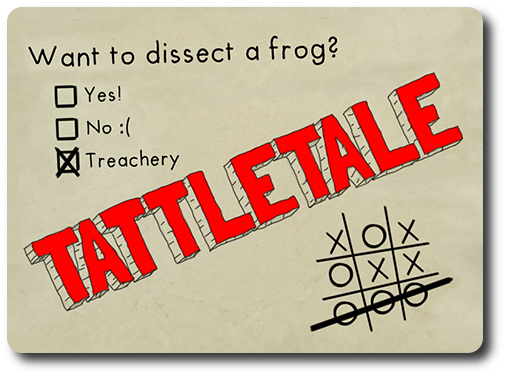 A neat idea, but just not for me.” All the Gamer Geeks rejected Tattletale! And there you have it. Tattletale!, like so many other Deduction games with a strong metagame under its covers, tends to only succeed when the players engage each other and really get into the game. In the case of Tattletale!, the metagame was hampered by the rules of the game and its flow. Some players found the game to be fun and some not. Everyone agreed it was an interesting idea and most individuals also suggested the game was going about it the wrong way. For example, only allowing a few players at a time to influence Glory kept other players out in the cold. But this is only true if plying with 4 or 5 players. Personally, I think the game is so-so at best. It’s small, plays in 15 or less minutes, and can be very enjoyable if you have the right group. I’ve enjoyed some games, disliked others, and always left the table ready for a meatier game. Which is to say, Tattletale! never satisfied me, but nor did it overly disappoint. If you have been looking for a game where friends and foes switch constantly, you need the help of others to beat them, and angry teachers go ballistic, then do give Tattletale! a try. Tagged Bluffing Games, Card Games, Deduction Games, Humor Games. Bookmark the permalink.